Lost: June 2005 contest 2nd place winner! Lost: June 2005 contest submission. 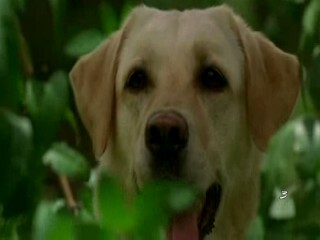 Vincent (Madison) is the unsung cast member of ABC's Lost. She is largely left out of the shows publicity as is her trainer Kim. The goal of this month's video contest is to highlight Vincent in a unique and special way. This contest is being sponsored by Rygwood Labradors the home of Lost resident dog Madison (Vincent). The top 3 winning videos will receive authentic Madison (Vincent) pawtographs sent to you from Rygwood Labs in Hawaii. Not to mention the prestige of having your video being highlighted not only on LVI but on the official site for Madison and Rygwood Labs. Kim Stahl, Madison's owner and trainer, will be a guest judge for the contest entries. Kim has been with Madison since she was a puppy so she better then anyone will know a good creative representation of Madison. Be creative and remember that this is an official sponsored contest so just putting Vincent clips randomly to a song will not cut it. You are not restricted to making a music video. Any kind of creative video centering around Vincent will work. Your video could promote Rygwood Labs, Madison and Kim, or just tell a story about Vincent the dog from Lost as long as you use Madison (Vincent). You are not bound by any strict regulations on this contest except creativity. We suggest trying to make your video tell some sort of story or have a central theme. That makes watching a video that much more interesting and can keep your viewers attention. -Your video can not be longer than 5 minutes. 3 minutes is the recommended length. You're not obligated to any specific time so please do not strive to fill 5 minutes. -When entering your video on the Submit page, enter "June 2005 contest submission" for the description.